For the fourth time in five years, a Jefferson (Philadelphia University + Thomas Jefferson University) student or alumni has won the John Stewardson Memorial Fellowship in Architecture. 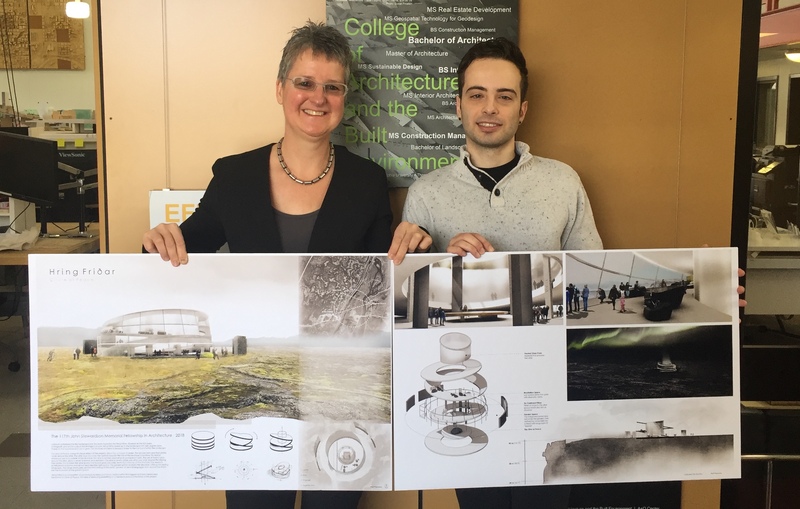 After reviewing more than 40 entries, the jury named architecture student Austin Dimare ’18 the winner for his proposal “Hring Friðar” on March 8 in the PSFS Building in Philadelphia. Jefferson architecture student Arthur Jonathan Loree ’18 was a finalist. The Stewardson, which provides a $10,000 traveling scholarship, is an annual competition of the seven accredited architecture programs in Pennsylvania, also including University of Pennsylvania, Drexel, Temple, Carnegie Mellon, Penn State and Marywood Universities. Upon the completion of his travels, Dimare will give a public formal presentation on his experience at Jefferson. The competition is a 10-day charrette undertaken solo, without any outside assistance. Dimare’s winning proposal was a design for a “House of Peace,” an architecture to house one of the George Nakashima-designed Altars for Peace to be located in the historically important Icelandic landscape, Þingvellir. His proposal will travel to all seven accredited institutions during the spring semester. The “beautiful, extraterrestrial-like” landscape of Iceland inspired Dimare’s Hring Friðar (Circle of Peace), he said. The idea of the circle encompassing the altar sets forth the idea of centrality, while also achieving a contemporary aesthetic relating to Nakashima’s ideas. In creating the program this year, the Stewardson Committee worked closely with renowned designer and woodworker Mira Nakashima to provide documentation of her father George Nakashima’s concept of the Altar for Peace, said Andrew Hart, assistant professor of architecture at Jefferson and managing secretary to the 117th John Stewardson Fellowship. The design jury panel included Mira Nakashima, a world-renowned woodworker and furniture designer; Val Warke, associate professor of architecture at Cornell AAP; and Kelly Vresilovic, founding partner of CaVA Architects. “Winning the prestigious John Stewardson Memorial Fellowship for the fourth time in five years is a great validation of the exceptional talent of our students,” said Barbara Klinkhammer, executive dean of Jefferson’s College of Architecture and the Built Environment. Recent Stewardson winners from Jefferson include Melanie Whedon ’14, Ryan Thompson ’16 and Daniel Silberman ’14. Visit here for more info on the Nakashima Foundation for Peace. The landscape of Iceland inspired Austin Dimare’s Hring Friðar (Circle of Peace). Click image to enlarge.